Be advised this guide is general - all notebooks are different. Not all of the instructions will pertain to your notebook. I am not responsible for what happens to your notebook as a result of you reading this! During the guide, I'll put in big red letters LIKE THIS at certain points to tell you where to stop if you're performing certain tasks like upgrading your RAM or replacing your power jack. -2 large magnets - These are an excellent way to hold your screws in place and remember where they go...you can get easily confused. If you don't have large magnets, you can substitute these with simple paper (don't hit it!) or paper covered in double-sided tape. -Sets of screwdrivers, including a small precision set. Many of you may be desktop veterans, and you all know that by leaving your PSU plugged in and touching the power supply with your bare hands, you can "ground" yourself, effectively clearing any static electricity in your hands that can kill sensitive computing components. Notebooks, though, are not equipped with internal power supplies, nor do they have dedicated grounds! You can solve this problem by touching any metal object nearby that is already grounded. 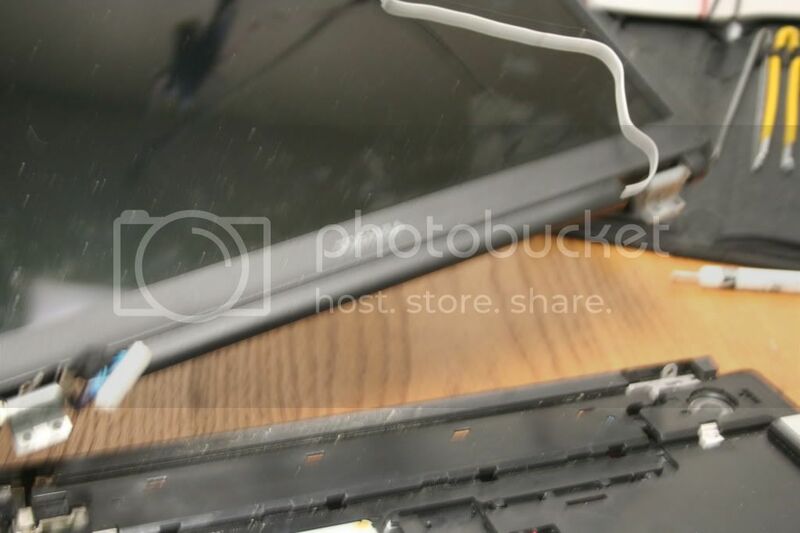 While notebooks are not grounded, as they rely completely on DC power, most of the notebook's internal chassis is connected to the negative terminal, in effect, what's called a "chassis ground". This can help stop ESD if you make contact with it. And, of course, don't work on carpet or in a chair made of plastic or static-generating fabric. If it won't move, don't force it to! Chances are you missed a screw someplace. Take some time and look at what you're working on. You'll find the place that's holding your component down soon enough. Now, on to disassembly. Providing pictures for today is my brother's old(er) Toshiba, which I've actually never disassembled. It should give a good depiction on what's inside of a notebook that's rather dirty. 1. First, unplug your notebook and remove it's battery. Generally the battery has a release catch or locking mechanism on the bottom. It should be clearly marked. 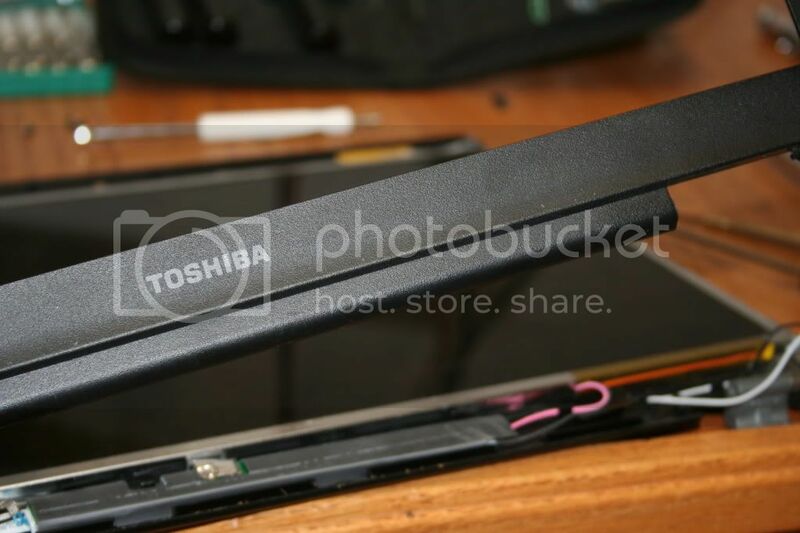 If your optical disk drive is equipped with a quick-release mechanism (usually a latch or catch on the bottom, but sometimes can also be a spring-loaded lever on the side of the notebook) you can remove it now. It may be held in place by a screw, so pay attention. There are two metal brackets running alongside the sticks. Push them, at the same time, away from the stick, and it should pop up slightly. Then simply pull it away from the socket at an angle. There are several antennas (2 or 3, depending on model) connected to the card. If you pull straight up on the connectors, they will simply pop off. If your card is PCI, follow the same procedure as you would with RAM. If your card is mini-PCI, you may need to unscrew two screws at the opposite end of the card with the connector to the motherboard. Then, slide the card out at an angle. If you've a bluetooth module, you'll find the procedure for removing it almost identical to the wireless card. On occasion it will be screwed down, as well. All hard disk assemblies are different. There are probably 10 or so different kinds...some pull straight up, others slide, others unlatch, some simply unscrew...The only real thing I can say here is to take a good look at it and use your brain! 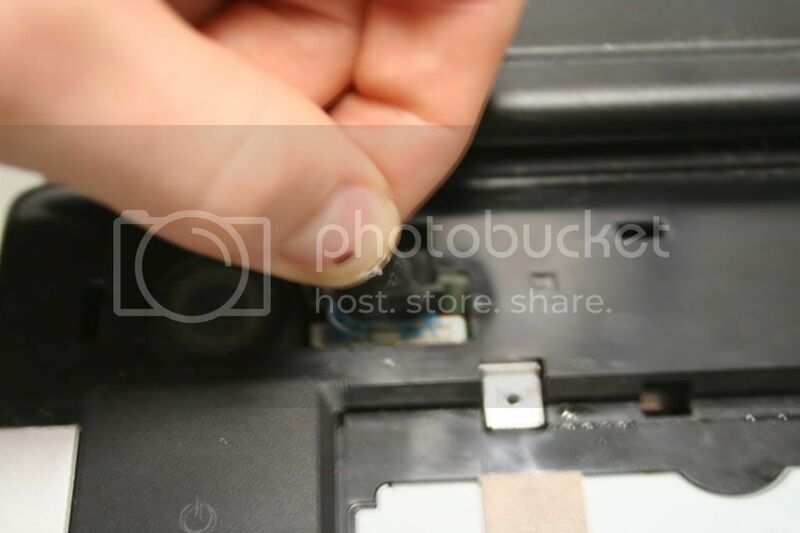 Some notebooks have a small metal tab held in place by a screw that holds your optical drive inside of the notebook. 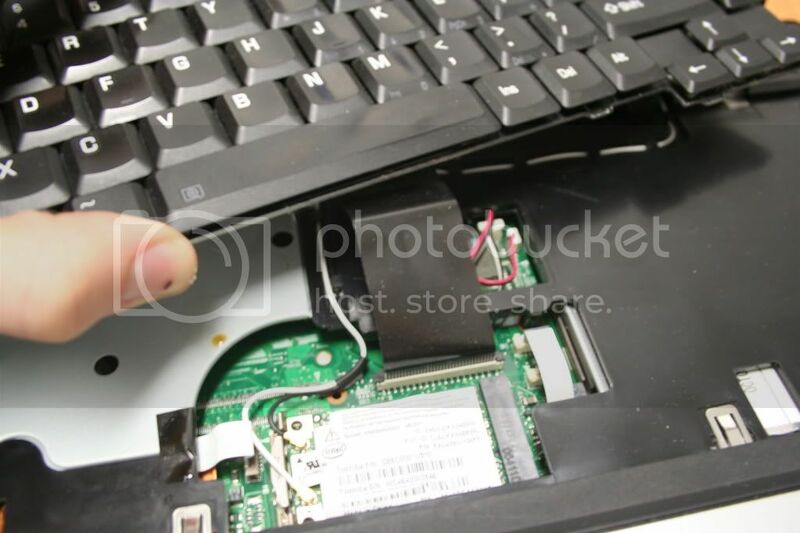 Unscrewing the screw and simply pushing on the drive casing will cause it to pop out of the notebook. If you don't see this, don't worry - this means the screw is upright on your notebook. We'll get it out when the keyboard comes off. 3. You'll notice the bottom of your notebook is covered in screw holes. Yup. You're taking them all out. Take your time (be careful not to strip them!) and place the screws on your magnet or paper in relation to where you took it out of the notebook. 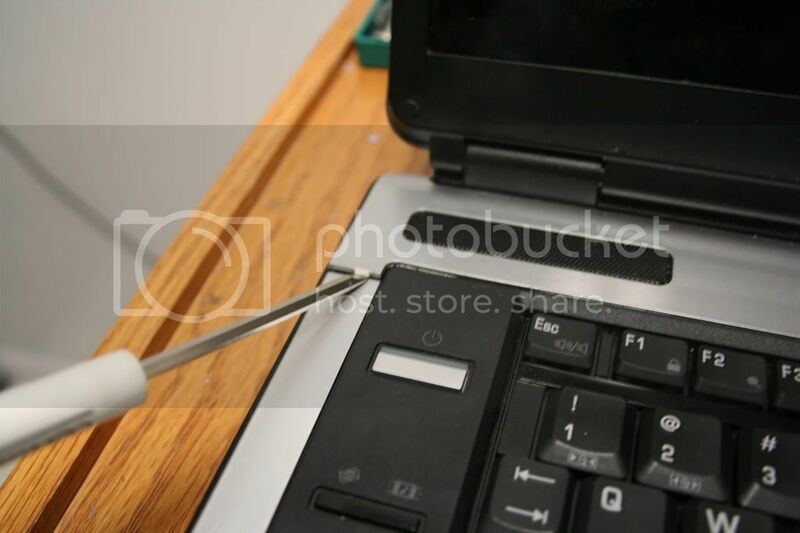 Sometimes, a screw will be reluctant to come out of it's hole - if this is the case, take your strong point magnet and attach it about halfway up to your screwdriver. Then place your screwdriver in the hole and carefully unscrew until you think the screw is free, and gently pull straight up. With some luck, the extra magnetic force will be enough to get the screw to come out. 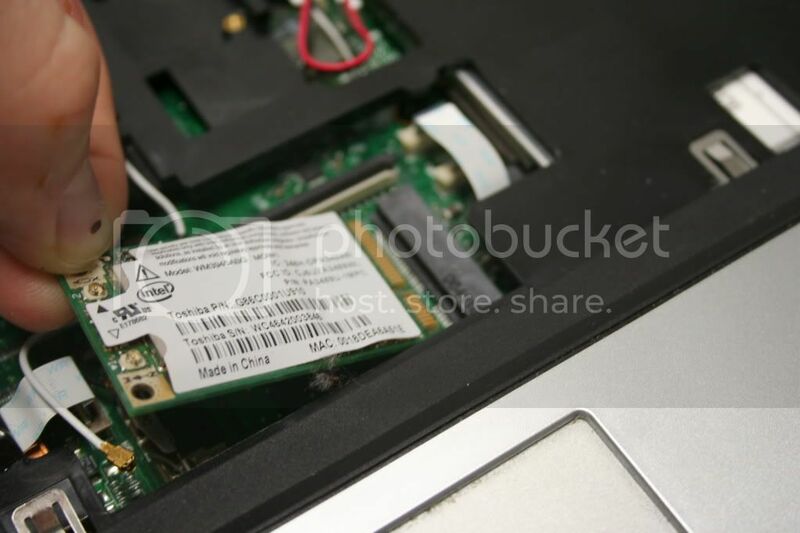 Sometimes manufacturers will be sneaky and place screws right at the edge of the casing underneath your optical drive - make sure you check back here when you remove your drive (if you haven't already). 4. Turn the notebook over, so it is now right side up. Open the monitor. 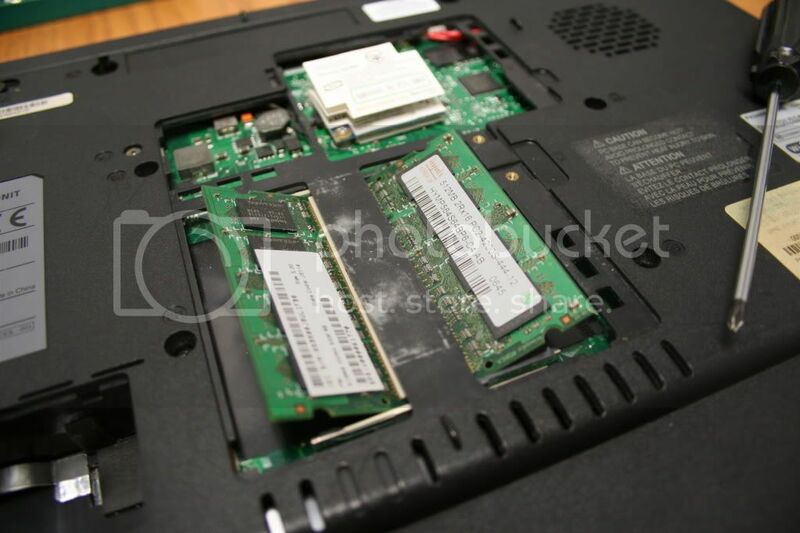 On most notebooks, the upper portion of the chassis right before the monitor is a separate plastic piece. It may have your power button and volume controls (if present) built into it, it may not. Whatever the case, it's held in place by plastic clips. (and sometimes screws...but you removed all of those, correct? It never hurts to double-check.) Go near the edge of the notebook (or if you see a better pry-point, take it!) with a fine flathead screwdriver and firmly but gently pry the peice up. Note: If the plastic pieces that cover your screen hinges prevent this piece's removal, go to step 6 and come right back here when you're done! 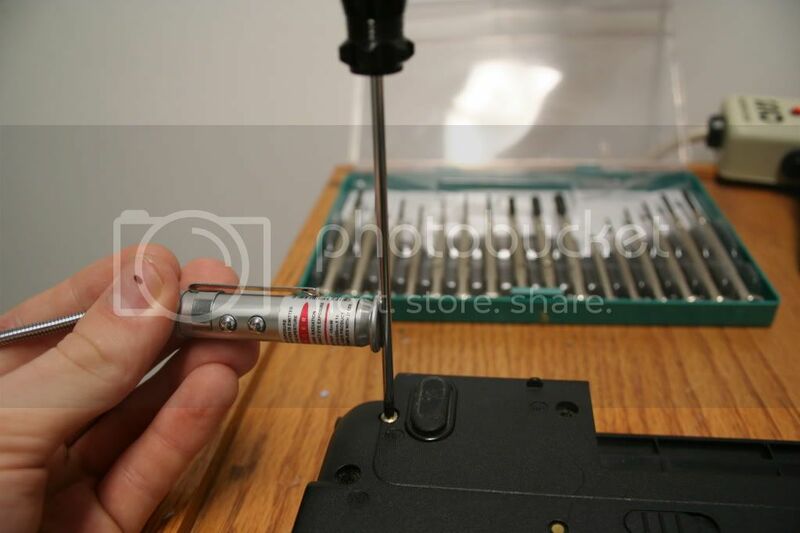 If you're careful, you won't do any damage to the plastic, but in some cases you may make a gouge where your screwdriver was - this is where smaller screwdrivers are the best. Once you get most of it up, you should be able to pry the rest off with your hands. After a few snaps and pops, the peice should be off. If it does have some sort of control on it, you'll need to remove the cable that connects to the motherboard now. Most of the time the cable can simply be pulled out, but sometimes it's held in place by a (usually) brown clip that must be pulled up. Just use your hand or a driver to pry it up, and the cable should pop out. Be very careful with these cables - they have very fine leads, and can easily be damaged by too much force or too many disassemblies. 5. Now it's time to remove your keyboard. Most notebooks will have a line of screws visible now which hold the keyboard down. Remove them, and slide the keyboard a bit up toward the monitor. You should now be able to easily lift it up a centimeter or two...but, surprise, there's another cable. It's a bigger version of the one you just dealt with. Unclip it, and remove the keyboard. 6. 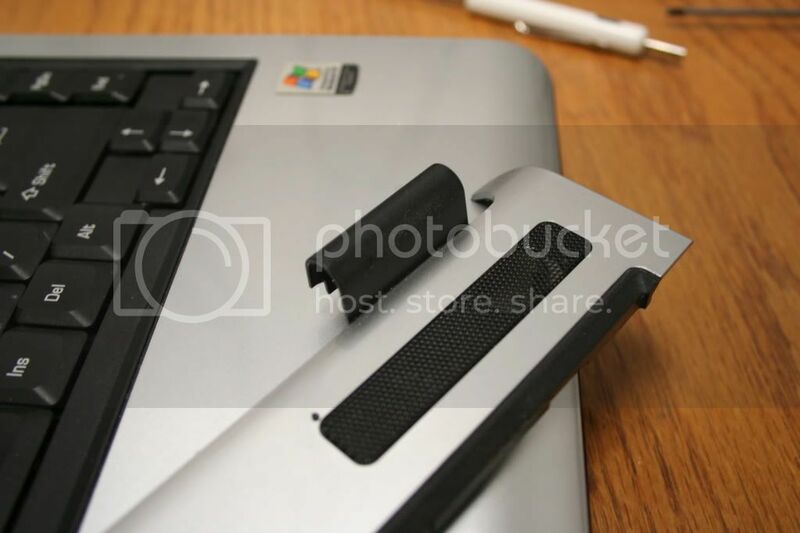 Take a look at your notebook's screen hinges. If they are exposed right now, meaning the plastic piece that covered them came off with the panel you removed in step 4, you're lucky, and you can skip this step. For the rest of you, you'll notice there's a plastic piece that's covering your screen hinges. You'll need to get it off to move on. Sometimes they are screwed down on the rear of the notebook, sometimes they are screwed down on the top, and sometimes they aren't at all. In my experience, these are the most difficult pieces to remove on the entire machine. They're held in place by plastic clips on almost every model, and screws on others. Take a good look and dive in prying with your screwdriver. They can be easily cracked, so be careful. Take your time. If you arrived here from step 4, remember to go back. It just so happens that I was lucky today. My hinge covers popped off with the top panel. 7. You may have noticed your notebook's plastic frame is a clamshell of two pieces. There's a bottom piece which is rather deep, and a top one which is rather shallow. You're now going to separate these two pieces. Take a look at the new space your keyboard has made, checking for screws that hold the top portion of your chassis in place. Remove any if you find them. Sometimes manufacturers will have large metal pieces that slide off or clip off, too. Some even require that the speakers be removed. Take a good look around and see what you need to do to clear away anything preventing that top piece of your chassis from coming off. 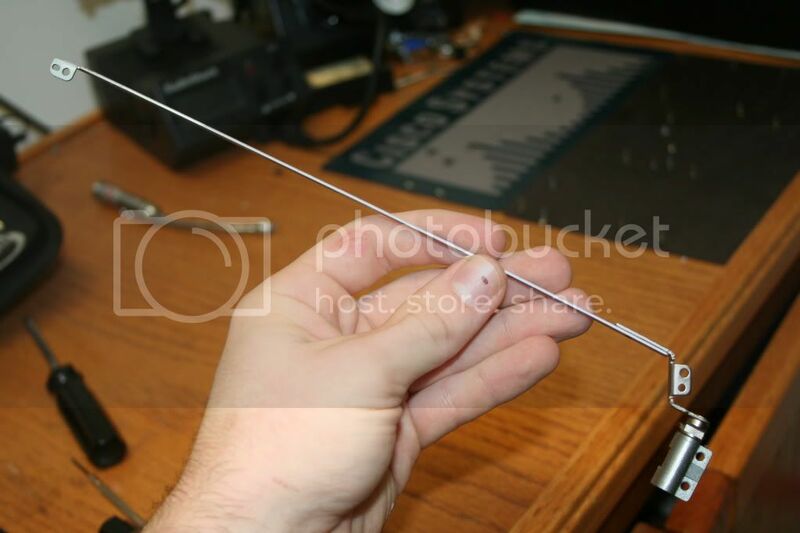 Remember to check for screws that will release your optical drive, if you haven't already. Note: If you notice that the anchors for your screen hinges prevent you from removing this piece, skip to step 9 and come right back! 8. Now that everything is free and clear, use your screwdriver to pry apart the two pieces of plastic that make the majority of your chassis. Yeah, you guessed it..they're held in place by plastic clips. 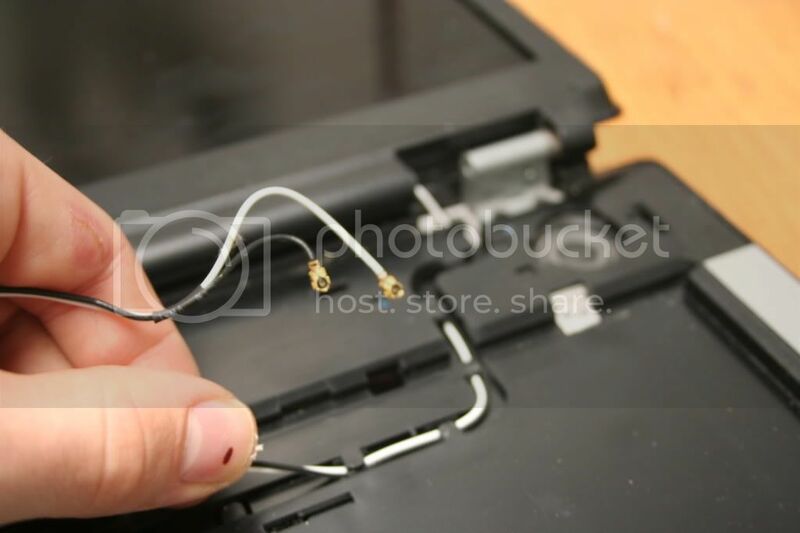 You may need to remove additional cabling for antennas or your touchpad. Pay attention to what you're pulling up on, and see what comes with it! 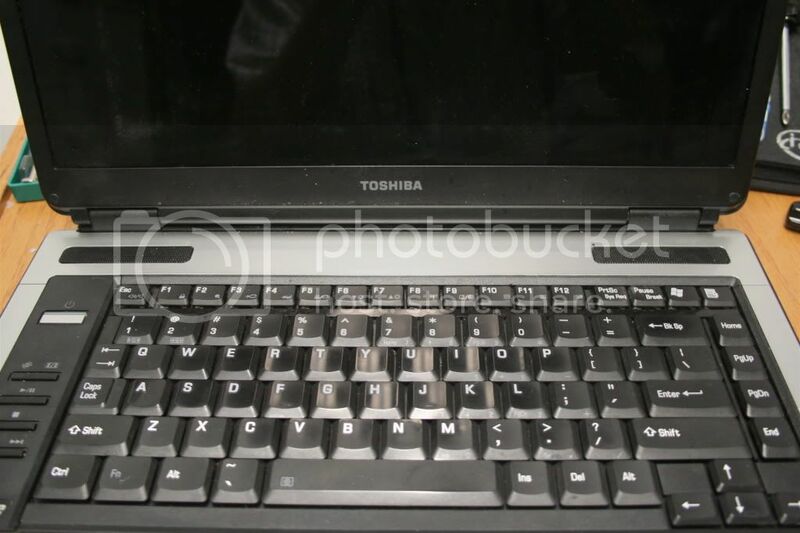 You should be removing the top portion of the plastic shell (the part that you rest your hands on while typing). Somewhere near your hinges all of these cables should meet up and go inside the screen housing. Follow them all back to where they lead on various boards. 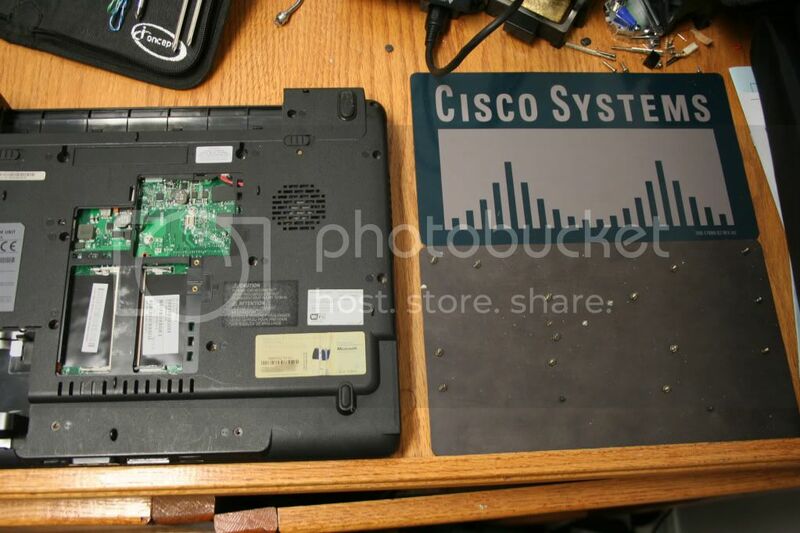 Wireless antennae will generally go through a hole in the chassis to the bottom of the notebook to where the wireless card is (which you already removed). You'll notice, though, that one cable has a very different connector than the rest - this one is pretty big, rectangular, and doesn't want to move. That's your video cable. Most of them come with plastic loops that you can put your finger in. Whatever the case, check that it is not in any way screwed down (of course) and then pull STRAIGHT UP on the connector. With some force, it should pop right off the board. 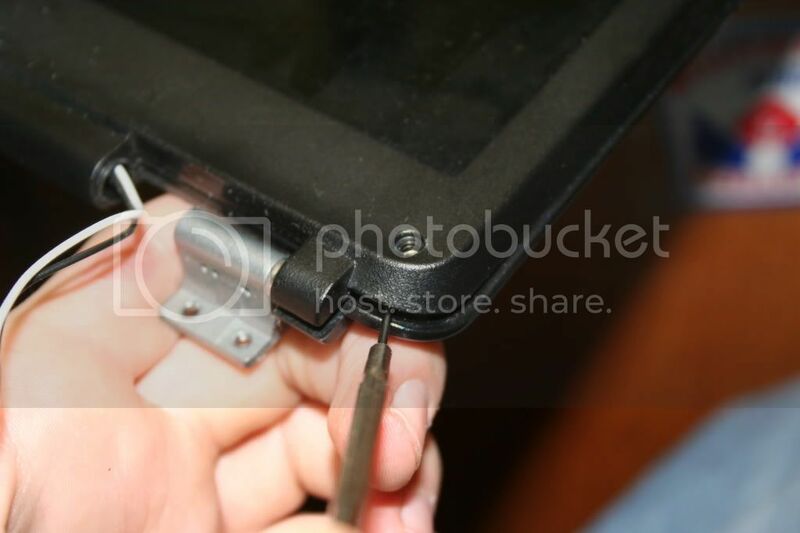 With all the cables removed that head to your screen, you can now begin unscrewing it. Common places for the screws are directly on the top of the notebook or in the rear. Take a good look around and remove all the ones you see, then gently lift straight up on your screen. It should pop right off. If you arrived here from step 7, remember to go back. ...and after all the screws are gone, so does the screen. 10. You now have a notebook void of a screen, keyboard, top shell, drives, memory, and extra add-on chips. What you're looking at now is your motherboard, a PCMCIA or Expresscard socket (if equipped with one), perhaps some metal pieces, a graphics card (if dedicated), and your CPU and its heatsink/fan (if it doesn't rest on the bottom of your motherboard). Unfortunately, this is where the value of this general guide degrades rapidly due to the drastic differences in notebook construction from model to model. Basically all you need to do now is remove anything in your way to get to the motherboard - they should all be simply screwed down with the screws facing right side up. Once all those parts are out of the way and the motherboard screws removed, gently lift the motherboard up, negotiating it out of the case. Often manufacturers will have sheet metal plates right around I/O ports that make it difficult to get the motherboard out, so watch for these. Also, make sure that the screws around your VGA/Serial port/LPT connections do not prevent you from removing the motherboard. A simple 5mm nut driver should remove these, though you can use pliers to turn them if needed. You may need to remove heatsink/fan assemblies before you remove the motherboard, you may not. Chances are if your heatsink is on top of the motherboard, you'll have to remove it. Like everything else, they're held in place by simple screws, though newer models may have spring-loaded screws. Remember when reassembling your heatsink to screw it back on the same way you would a tire on your car - move in a "star" pattern (or diagnolly) giving each screw only a few turns at a time to ensure your heatsink is seated evenly on top of your CPU. After a few screws and some gentle tugs, the motherboard is freed. This procedure is no different than a desktop heatsink. Take your heatsink out to the garage and blow compressed air through it, getting all those nasty dust bunnies out. Make sure you do the same with your fan. Then, using as pure alcohol as you can get (90% isopropyl is good), clean the contact point on the heatsink that interfaces with the CPU die. I usually use Q-tips, and then check for cotton fibers with a 13x microscope, but you don't have to go so far. Once the heatsink and the CPU die are clean and air dried, apply your favorite thermal paste in your favorite application method. Personally, I like to spread it and check it, but you may like to dot some on and let the heatsink do the work. It should be pretty obvious by now how to remove it, but if not, here's some general instructions. There are two kinds of GPUs that I've encountered: slot and socket type. The socket type are screwed down and, once the screws are removed, can be freed by pulling straight upward on the board. If you notice your card has a slot (like a bigger version of the PCI or mini-PCI slot), then it will need to be unscrewed and lifted slightly from the non-slot end. Once lifted, it can be pulled out of the slot in much the same fashion as your wireless card or RAM. -Well, your notebook is pretty much in pieces, so any major hardware repair (like re-soldering your power jack) can be done now. If you're this far, it's worth it to thoroughly clean your heatsink and replace your thermal paste. 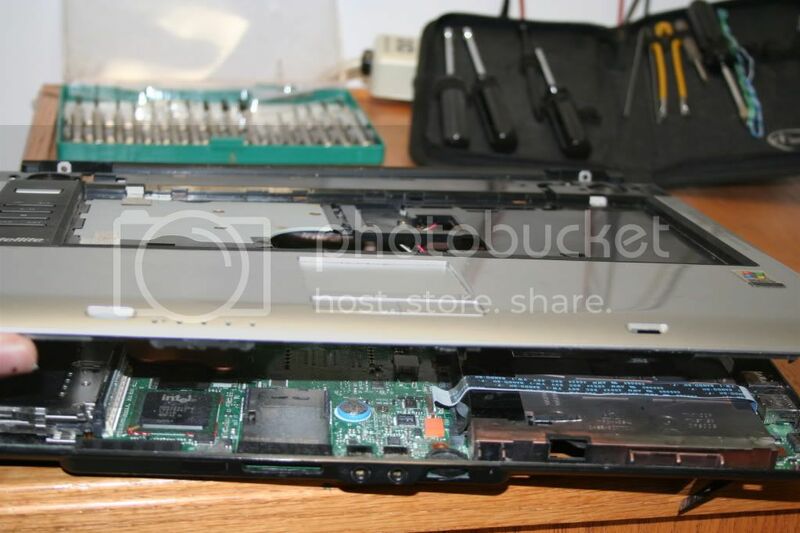 Most of the time, you will never need to disassembly your LCD for any reason. But, everything does break, so, if you need to, here's a guide on how to get the job done. 1. 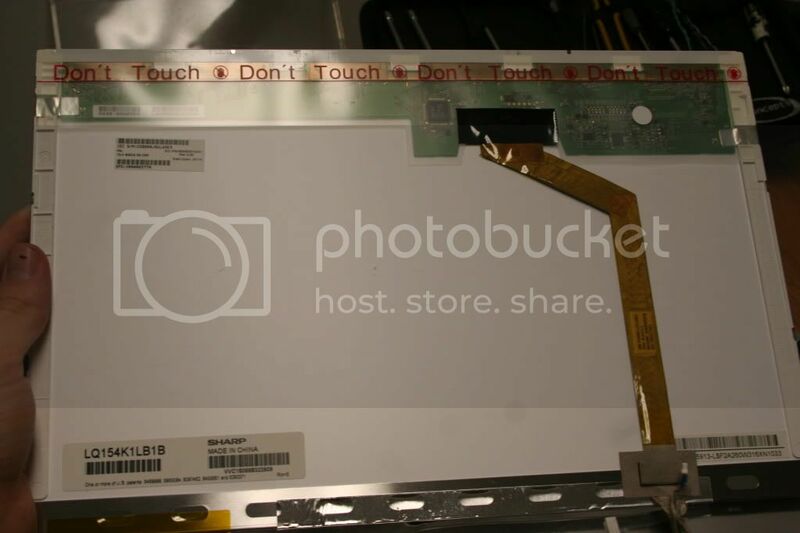 Now that your LCD is separated from your notebook, take a look around it's inside edge. You may notice some circular cutouts or rubbery pads. Behind these are screws. The pads or cutouts are simply glued on, so prying them off with a screwdriver is fine; the glue is sticky enough so that they'll adhere again when you're finished working. After you've got them off, remove the screws. 2. You'll notice the LCD is a clamshell of two plastic pieces just like the rest of the notebook. Guess what? They're held in place by plastic clips! It's usually best to start prying with your flathead near the hinges, but if you find a better spot on your model, take it. Some manufacturers will put a sticky glue on the inner plastic bezel around the edge of the LCD, so don't worry if that doesn't come up right away. It's physically impossible for any plastic clips to be there, as the LCD is in the way - just pull up on it, and it'll come off. 3. Now that the front bezel is off, you'll notice the hinges have a metal frame that extends all the way up the screen and around the top. 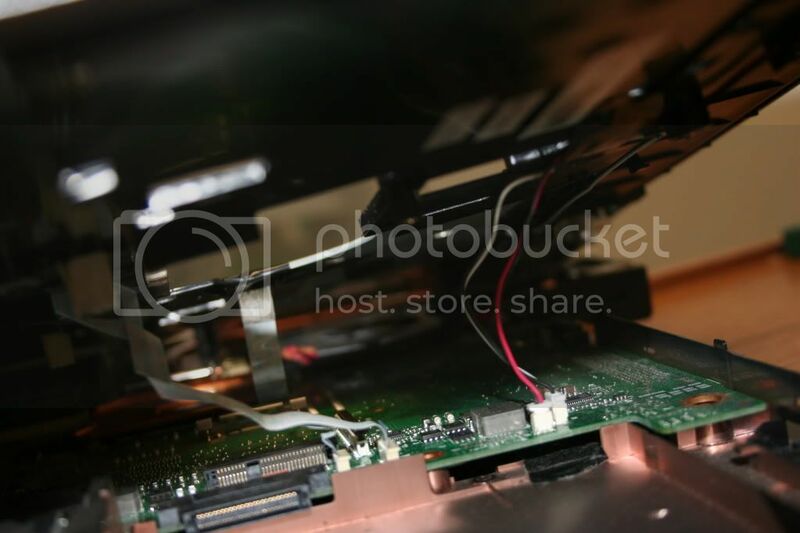 On this frame are several screws that hold your LCD in place - remove them, and the LCD is free to remove, but DO NOT pull up on it just yet! If you need to repair or replace the inverter, it's the board that sits at the bottom of the assembly. It is sometimes encased in a white or black vinyl wrapping. 4. 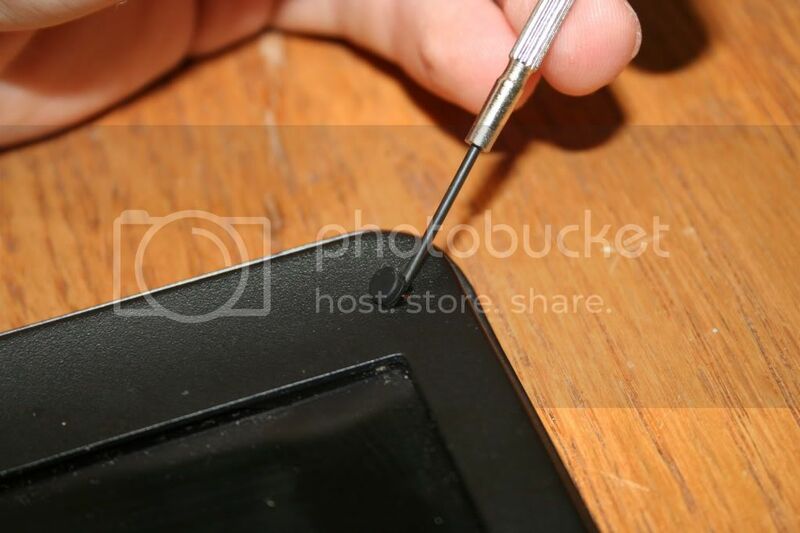 Gently lift the LCD a few centimeters. Most manufacturers put cables back here that are very thin and do not have much extra length (as there's nowhere in the casing to put the extra cable) - therefore, everything back here is very delicate and easy to break or rip. Take a look behind the display with your flashlight and find out what you have to disconnect in order to get the screen free. 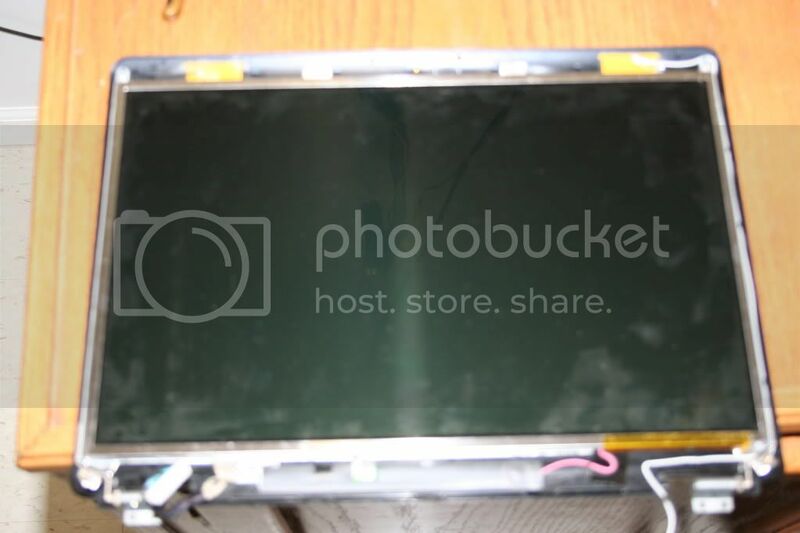 Then, without bending the display too much, lift the LCD from it's frame. The rear of the LCD. I got lucky with this model; the cable you see is taped to the LCD - you may not be so lucky. That's about it for the LCD assembly - you can replace the hinges, LCD, and inverter all from here. Well, your notebook is in dozens of pieces by now. 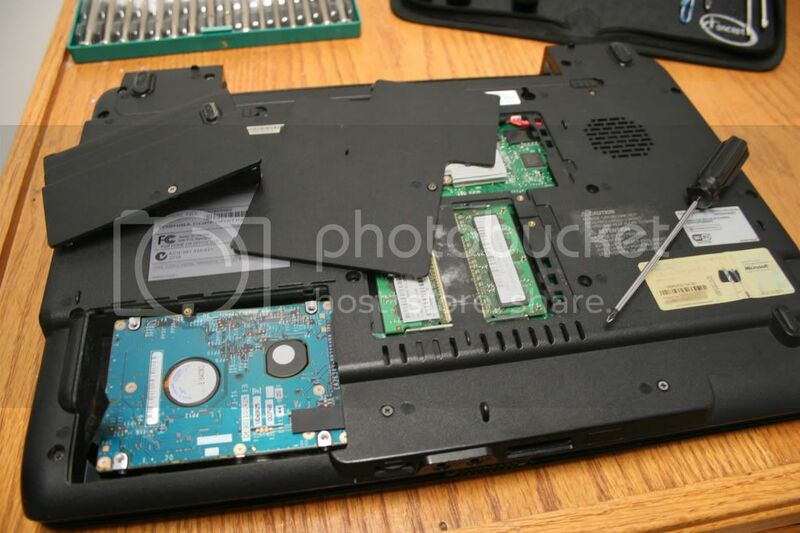 Reversing the steps should get you back to a fully assembled (and hopefully fully functional) notebook. I hope you found this guide useful, and that you'll pass it along to help someone else. great one, in a year I open about a thousand laptop thats 4 a day.. I tried to make this one general so that it would apply to all notebook designs. I don't personally own an HP, let alone a dv series one, but I completely agree with you...those things have twice as many screws and cables and secondary boards as other notebooks. The design is just insane. hi frozenlead, thanks so much for your tutorial, it sure is detailed and helpful! 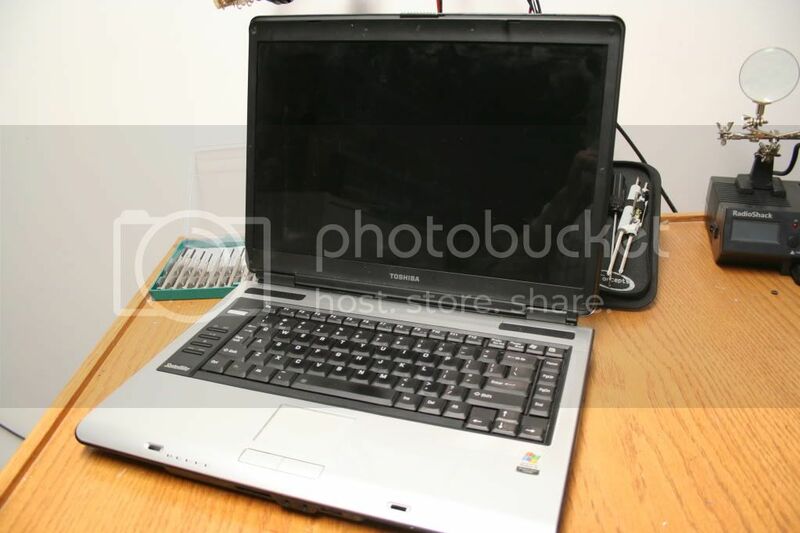 i actually have the same exact laptop you used in the pictures (toshiba satellite a 100), and i need to clean the heatsink. so my question is, should i indeed stop at the point you tell us to stop (in red) in order to get to the heatsink?, or do i need to take the whole thing apart basically? I'm glad it helped you out! 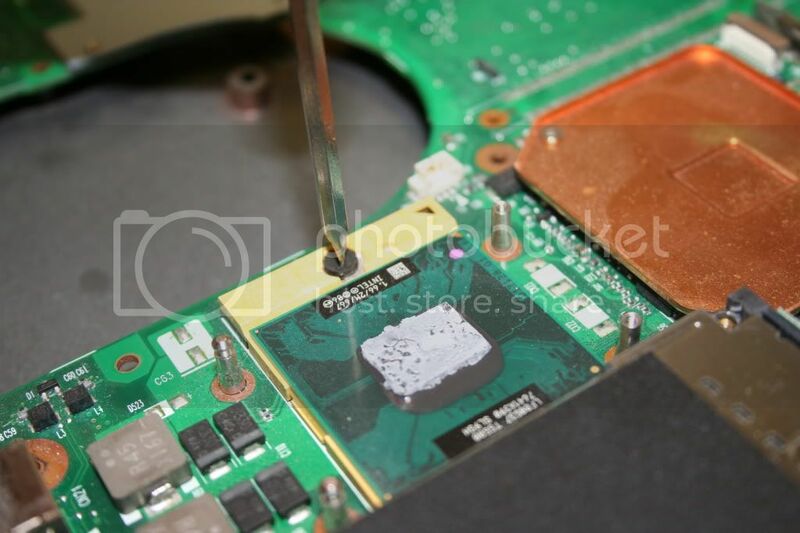 How much you want to clean the heatsink will determine how far you should disassemble the notebook. If you want to completely clean it and make it like-new, you only need to get to the point where you can see the heatsink unobstructed in step 10, but you don't need to remove the motherboard or anything farther. You can clean the heatsink without even dismantling the notebook by blowing compressed air through the vents, but this doesn't do as good a job as removing it will. If that's the case, I highly suggest you at least blow out your heatsinks with compressed air - this requires no disassembly whatsoever. Yup. It may not be the most effective way, but it will certainly be better than nothing. Okay, thanks guys ...I'll see what I can do. Thanks again for the help!!! Thanks for the tutorial frozenlead, its taken away a lot of the uncertainty i have of fiddling around inside laptops! I was just wondering if the machine in the tut, the Satellite A100, is basically the same inside as the Equium A100? Specifically, is the cpu removable? I have an Equium A100 027 that belonged to my partner and i need to replace the cpu, or at least i think that's what it needs to get it working again. The machine will no longer power up and before it died completely, it used to suddenly cut out with no warning while in use. This would happen whether it was running on mains power or from the battery. The period of time it would take before the machine would cut out gradually became shorter and shorter - it went from lasting about an hour or two until eventually it wouldn't even stay on long enough to finish POST. By the time i got my hands on it, the machine was basically a doorstop. I think the cpu had been running too hot, maybe the fan wasn't spinning fast enough or something, and its caused permanent damage to the cpu over time. Which is why i want to replace it if possible and save myself the expense of buying a new laptop. Then I'd be more than happy to help as best I can. What is exectly the harddisk/harddrive? I have to take it out, because due to LCD Damage, i probably get a new 1, and want to take out my Harddisk. A hard disk is the part of your computer that permanently stores your data. Your OS, programs, and any other documents you have are stored on it. 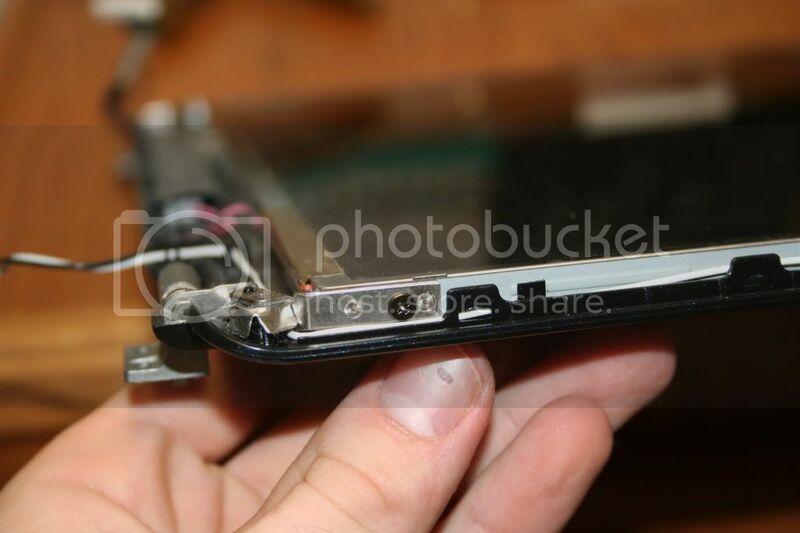 Your LCD breaking doesn't have much to do with your hard disk. You probably won't need a new disk. thanks alot for this detailed tutorial. I'm about to open up my laptop as well. I have the Satellite Pro A100 and I think the cable connecting my graphic card and LCD is somehow broken/loose, don't know. My LCD won't show anything anymore, except for the backlight LEDs. I then connected an external CRT monitor to my laptop with a VGA cable and it works. So I think it must have something to do with the cable. I don't have any warranty left so I wanted to 'fix' it myself. So, do I have to follow your guide step by step in order to reach this cable? You certainly don't have to, but you can if you want. I remove the monitor cable in step 9, here. Can my hp 15 notebook run sims 4? My Asus laptop easily drain charge even when I am nit using it. How well can my laptop run Skyrim (normal edition)? HP Pavillion laptop/notebook cracked faceplate (wrist rests on when typing).